The University of New Brunswick Saint John has launched its first mobile application for smartphones. 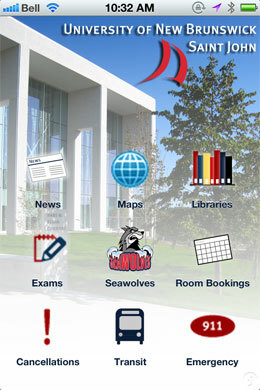 The mobile app, available for Apple devices such as the iPhone, iPod Touch or iPad, provides convenient access to the most frequently requested information and electronic resources such as UNB news or campus maps. The UNB Saint John mobile app is available for free on the Apple App store. It recently appeared as a Featured App. A Blackberry and Android version of the UNB Saint John mobile application will be available soon. “We know mobile devices like smartphones and tablet computers are increasingly the way that our students, faculty and staff expect to be able to access information on the go,” says Karen Keiller, director of Information Services and Systems at UNB Saint John. The new app provides instant access to UNB news, campus maps, library services, exam and transit schedules, Seawolves varsity sports schedules, study room bookings, class cancellations and emergency contact information. More items and features will be added to the app over time. Reviews and feedback are encouraged so the app can be continuously improved. Search in the app store for UNBSJ, write a review, or send an email to HWKCommons@unb.ca. The project was funded from the UNB Saint John Student Technology Fee and uses the Desire2Learn Campus Life service. UNB has experienced triple digit growth over the past year in the number of visits to its website and key electronic resources from mobile devices, a trend that is expected to continue well into the future. “Traffic to UNB’s website has been growing for the past three years, but mobile growth in particular has been impressive over the past year,” says David Shipley, UNB’s web strategist. For more information, contact Heather Campbell at hcampbel@unb.ca or 648-5697.